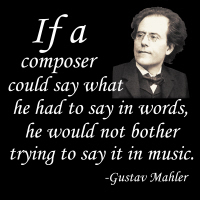 Composer Gustav Mahler’s pithy observation captures the essence of what drives practitioners of the art and craft of musical composition. Those who appreciate their work, or who themselves are composers or composition majors, find this quote especially to the point. Now you can own this quote yourself, or give it to that special someone who puts pen to score paper and tries to express his or her innermost impulses and passions! Buy it now on a t-shirt, hoodie, mug, tote bag or other quality gift or apparel items. Choose something for your favorite musician or composer, exclusively from GearGems! Mahler lovers should also not miss this great portrait design as well!